Security models for 3G and 4G networks based on Universal SIM cards worked very well. But they are not fully applicable to the unique security requirements of 5G networks. 5G will face additional challenges due to increased user privacy concerns, new trust and service models and requirements to support IoT and mission-critical applications. While multiple books already exist on 5G, this is the first to focus exclusively on security for the emerging 5G ecosystem. 5G networks are not only expected to be faster, but provide a backbone for many new services, such as IoT and the Industrial Internet. Those services will provide connectivity for everything from autonomous cars and UAVs to remote health monitoring through body-attached sensors, smart logistics through item tracking to remote diagnostics and preventive maintenance of equipment. Most services will be integrated with Cloud computing and novel concepts, such as mobile edge computing, which will require smooth and transparent communications between user devices, data centers and operator networks. 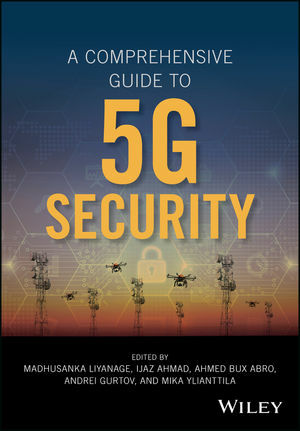 Providing a comprehensive guide to state-of-the-art in 5G security theory and practice, A Comprehensive Guide to 5G Security is an important working resource for researchers, engineers and business professionals working on 5G development and deployment. Madhusanka Liyanage, PhD, is a post-doctoral researcher at the Centre for Wireless Communications, University of Oulu, Finland. Ijaz Ahmad, MSc, is a PhD candidate at the University of Oulu, Finland. Ahmed Abro, MS, is an Enterprise Solutions Architect at VMware, Inc., United States. Andrei Gurtov, PhD, is a professor in the Department of Computer and Information Science, Linköping University, Sweden. Mika Ylianttila, PhD, is a professor at the Centre for Wireless Communications, University of Oulu, Finland.